Head south, towards Kakavia, and take the right turn at Jergucati and follow this road over the mountains. On the descent there is a choice of roads, both of which go to Saranda. The main road to the left, which follows the valley of the Bistrice River, is the better road. The other, much poorer, road goes via the town of Delvina. At the foot of the mountains is the source of the Bistrice River. 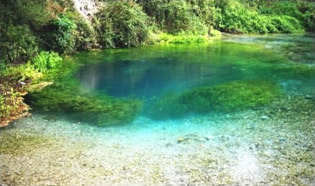 At the head of the river there is a wonderful freshwater spring, known as the Blue Eye (Syri i Kaltër), where the clear blue water bubbles up from a stunning deep pool. It is well worth a visit. To get there, stop at the bar and shop on the main road, at the foot of the mountains and ask for directions. A small track takes you past a fish farm and lake to the Blue Eye and its small visitor centre and restaurant. 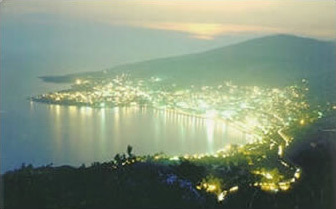 Saranda is a popular weekend destination for many Gjirokastra inhabitants. It offers superb beaches and a vibrant night life. There are regular buses from Gjirokastra that take around an hour to reach Saranda. Although a day trip from Gjirokastra is perfectly possible you may want to stay overnight to fully explore Saranda. 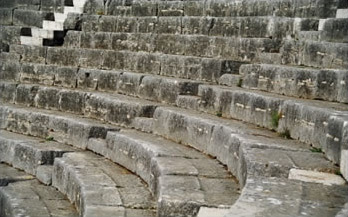 From Saranda you will be able to catch a bus or taxi to Butrint. From the main square take the lower road, which joins the main road out of Saranda back towards Gjiorkastra. After 200 m, where the road rises, turn right onto the road for Ksamili and Butrint. The journey time from Saranda to Butrint is about 20 minutes. From the road there are spectacular views across Lake Butrint to the ancient city and out across the Corfu Straits. 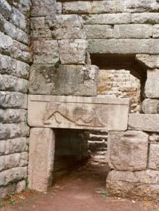 The theatre (left) and the Lions Gate (right) at Butrint.